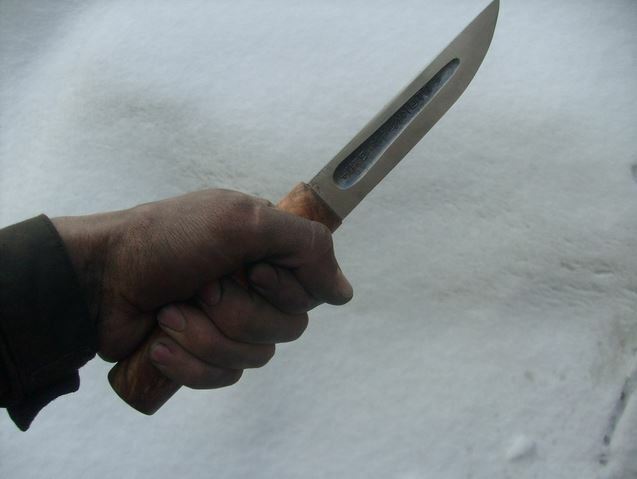 One of my favourite types of knives originates in northern Scandinavian countries and was used by Indigenous Sami people as well as Vikings and woodsman throughout the region (one example being the puuko). This type of knife generally has a 4-6 inch blade, a simple oval shaped handle, and a zero or flat grind (which is also referred to as a Scandi grind). These knives are used as general utility, bushcrafting, and carving knives. 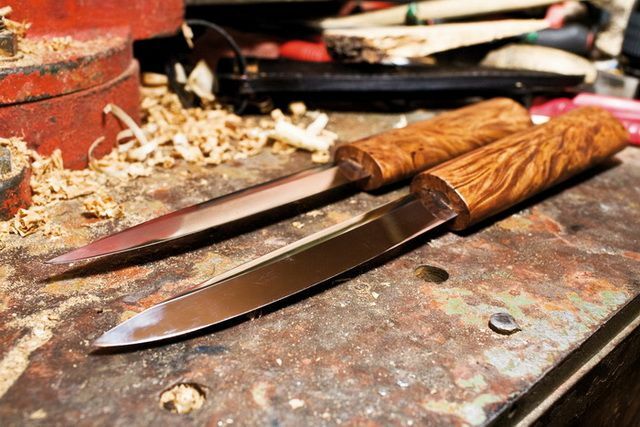 Mora of Sweden and Helle, based in Norway, are two well known producers of these types of knives. Recently, while I was doing some research on northern Scandinavian knives, I stumbled upon a similar but unique knife used by the Yakut, an Indigenous peoples in the north of Siberia. The Yakut, in fact, have had a thriving blacksmith tradition for hundreds of years and produced a wide variety of edged tools, from spear points to swords, large butchering knives, hunting knives, and carving knives. Blacksmiths were an important part of the Yakut culture, and were highly regarded for their ability to transform metal into tools and weapons. The Yakut seem to have maintained a strong tradition of knife making and continue to produce their unique types of knives to this day. Mora Knife No. 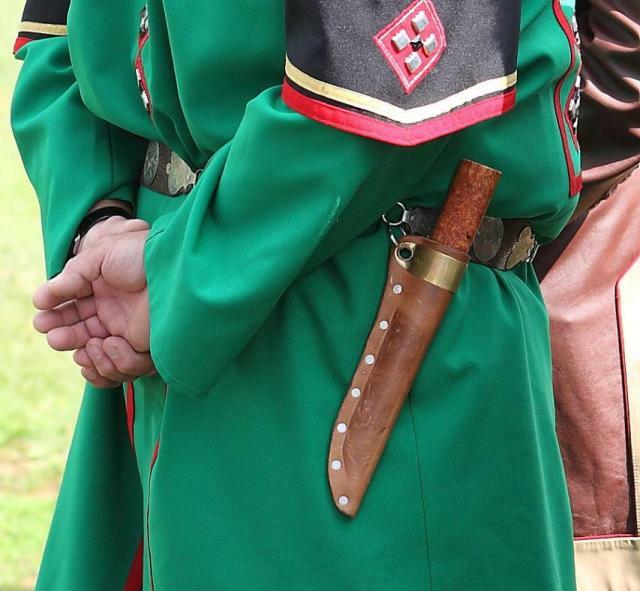 1, a classic knife type used throughout the Scandinavian countries of northern Europe. One of the most commonly produced knives appears to be a large utility knife, with a blade length of 4-6 inches. The blade is also somewhat slender with a trailing or slightly up swept point (similar to Mora’s Forest Exclusive blade). The unique feature of this knife is that the blade is asymmetrical; one side of the blade has a groove in it and a chisel grind, while the other side has no groove and is basically a convex edge (meaning it rounds down to the edge, rather than having a straight bevel). An old Yakut knife (perhaps from the late 19th century, the handle decorated with metal work. 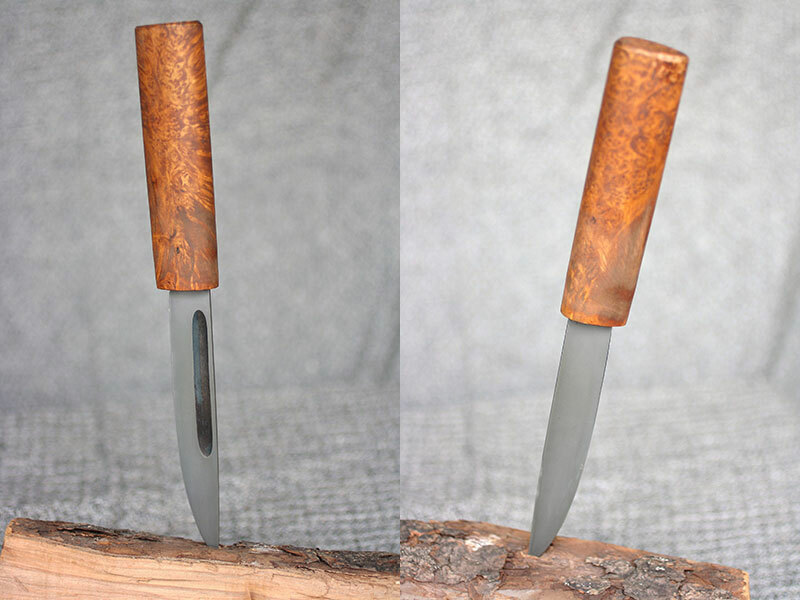 The knife handle is traditionally made from birch burl and is thick and egg-shaped in cross-section. It fits the hand and can also be used wearing gloves. 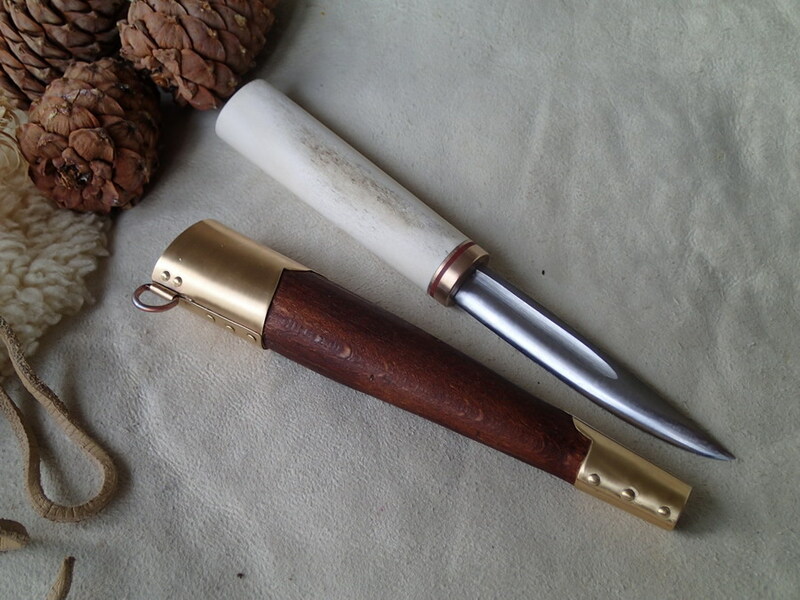 The birch also protects the hand from the cold effects of the knife steel in extreme cold, a common condition in Siberia during winter months. A Yakut wearing traditional clothing and a knife. 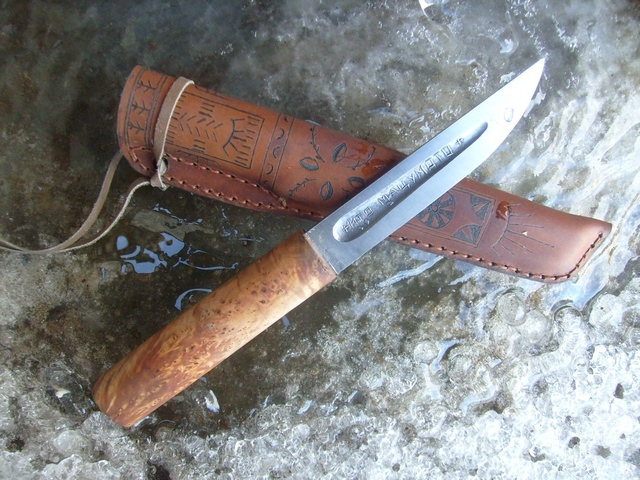 This type of knife was traditionally worn by every adult Yakut and served as a utility and hunting/fishing knife, as well as a last resort weapon. Today it has become known as the Yakut knife. The Yakut appear to have traditionally referred to this knife as either a batyya, or bult bysaga (a hunting knife, with up to a 6 inch, or 15 cm, long blade), or a bysax (a shorter utility knife, with a blade length of up to 4 inches, or 10 cm). Annual knife and crafts fair in Yakutsia, 2014. 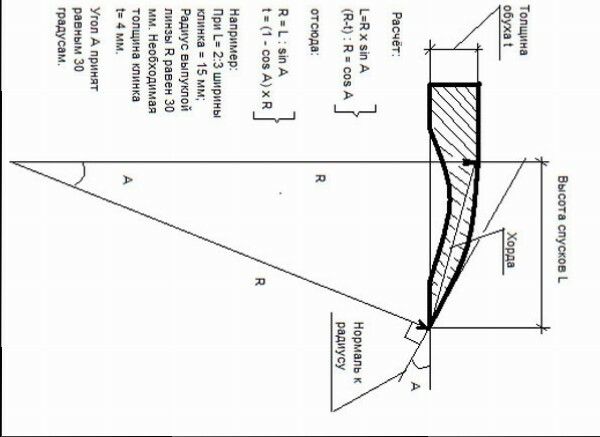 A cross-section of a Yakut blade, showing the asymmetrical design. From a Russian knife website. (pp. 167-169, The Yakut, by Waldemar Jochelson, American Museum of Natural History, 1933). Yakut knife by Ito Matsumoto, posted on Bladesmithforums.com. Yakut knife blades by Ito Matsumoto, BladesmithForum.com. 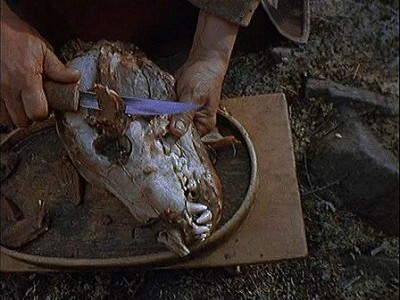 By Tamoko, on BushcraftUK.com, Thread: Reconstruction Yakut knife. The Yakut, sometimes referred to as Sakha, are an Indigenous tribal people inhabiting the region of northern Siberia. They are usually described as a Turkic people. Yakuts mainly live in the Republic of Sakha (also known as the Yakut Republic) in the Russian Federation, with some extending to the Amur, Magadan, Sakhalin regions, and the Taymyr and Evenki Autonomous Districts. 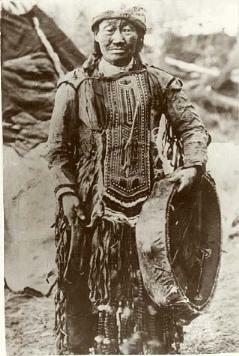 Yakut shaman with a drum, early 1900s. Illinois State Museum. In the northern part of their territory, the Yakut were primarily reindeer herders, hunters and fishers living a semi-nomadic life. In the southern region, Yakut traditionally raised cattle and horses. Like other Siberian Indigenous peoples, the Yakut culture closely resembles those found in North America, with similar beliefs and world views (including the practise of shamanism). Russians began invading and occupying parts of the Yakut territory in the 1620s, resulting in conflicts and revolts that the Russians ruthlessly repressed by burning villages, conducting massacres, torture, etc. Along with war, the Russians also brought deadly diseases which caused even greater casualties. 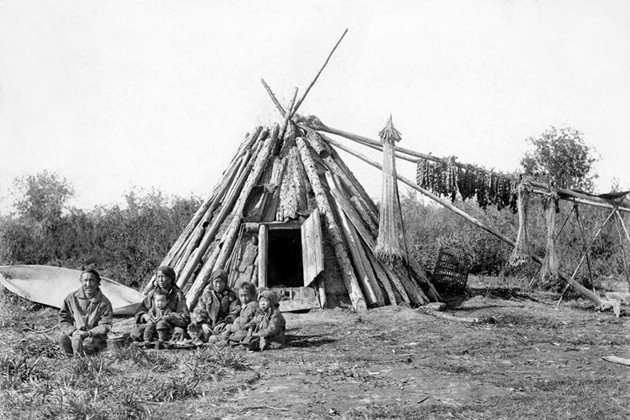 Between 1642 and 1682, it is estimated that the Yakut population declined by as much as 70 percent. Yakut with horses specially adapted to the Siberian winters. population within the Yakut Republic. 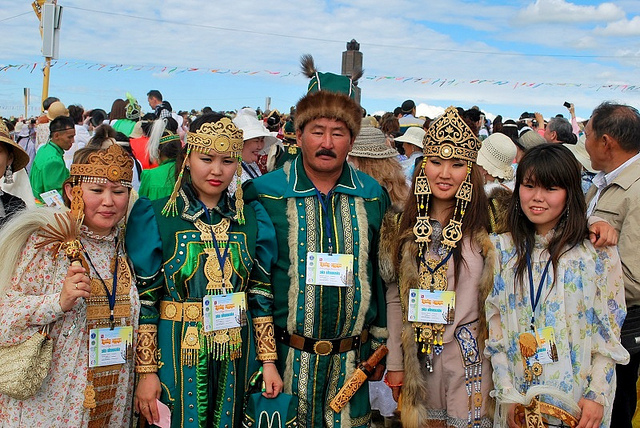 According to the 2010 Russian census, there were a total of 466,492 Yakuts residing in the Yakut Republic during that year, or 49.9% of the total population of the Republic. Like Indigenous peoples around the world, the Yakut struggle against resource exploitation on their traditional lands, including oil and gas pipelines as well as mines. Blacksmiths have always been high on the social ladder of the Sakha people. According to the legend, blacksmiths were considered the elder brothers of shamans, who often dreaded their fire mastery abilities. 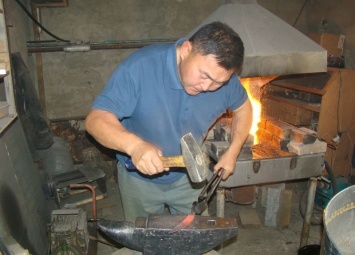 Today we are talking to Nikolai Popov, one of the best Yakut blacksmiths. Nikolai, when did you take interest in blacksmithing? Ever since I was a kid. It’s not surprising since many of my ancestors were master blacksmiths. I made my first knife from an iron door hinge when I was twelve. I had it with me for many years. At first, it was just a hobby, but I took up blacksmithing quite seriously after graduating from university. 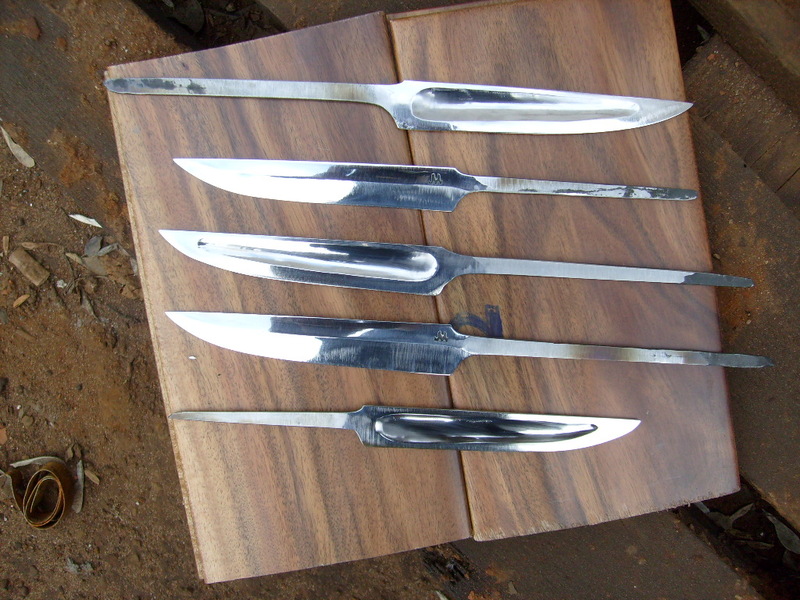 Apart from knives, I also make khomuses. In 1991, I made the world’s first electronic khomus. Its operation is based on the principles of electromagnetism. On the recent 25th Blade: Traditions and Modernity International Exhibition you won the gold award in the Best Artistically Crafted Knife category. It was the fourth time I had taken part in that exhibition. I won awards in different categories in the other years. The category I had been nominated for this time is the most prestigious exhibition award. The jury panel included representatives of the Russian Ministry of Culture. Knives in this category are evaluated not by their working properties (e.g. metal quality, cutting properties, and area of use) but by their aesthetic element, as a piece of art. 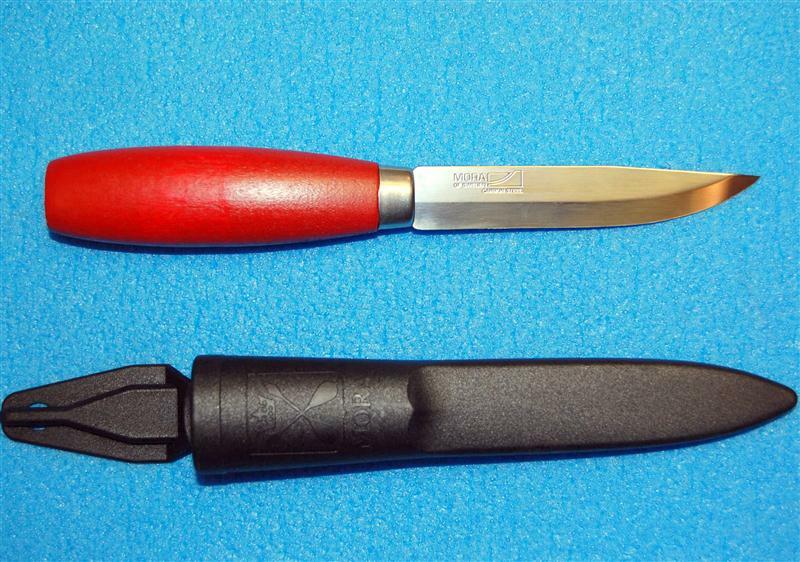 I had a few serious competitors, both among individual knife makers and reputable companies, such as Zlatoust-based AiR, the oldest knife manufacturer in the CIS. It took me two years to make this knife. The pattern gradually changed, I constantly remodeled and refined it. My work resulted in the knife adorned with 114 diamonds and 250 lab-grown emeralds with a Damascus steel blade and birch burl handle and sheath. It has about 300g of silver and 40g of gold. Your winning the award will probably contribute to making Yakut blacksmithing popular. How would you evaluate the awareness of such Yakut brand as the Yakut knife? When I took part in the exhibition for the first time in 2004, there were no Yakut knives presented at the event. My knives were sold out the first day and I was surprised at such great interest. However, the next time I participated in the exhibition I noticed that the number of so called Yakut knives increased. Those buyers at the previous event turned out to be big company managers. Later some company representatives admitted that they had replicated my knives. I don’t hold a grudge against them, all the more so because true blade lovers know that an authentic Yakut knife can be bought only from Yakut blacksmiths. The Yakut knife, one of the best in the world, is considered all-purpose. It has only the necessary and nothing more. It didn’t always have the shape it has now; the evolution of the knife blade took several hundred years. 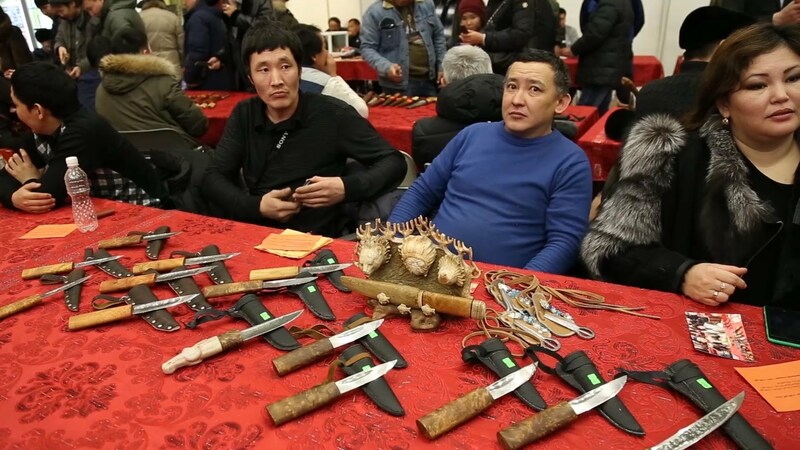 The shape of the knife is tailored to a certain task but while other peoples have different knives for specific purposes, a Yakut man has always been a hunter, fisherman, carpenter, etc., which explains why knives are made all-purpose. Larger bysax (knife) used to skin bear by Yakut hunter. According to the Yakut mythology, blacksmiths possess great supernatural powers. As one myth says, shamans were afraid only of blacksmiths. Only the smith could resist dark and evil shamans. It is true. The blacksmith as a person who knew the secret of smelting metal was respected. It was a blacksmith who made many of shaman’s sacred objects. According to the legend, the blacksmith placed certain restrictions while making them so that the shaman could not use his powers against smiths. The myths say that blacksmiths belong neither to the Upper nor Lower World. Kudai Bakhsy, a deity and the progenitor of all smiths, lives in the Lower World, yet is closer to the Middle one and considered a neutral character. 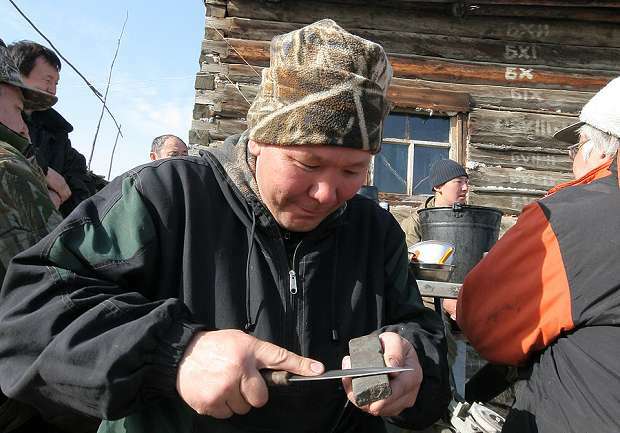 Is it possible to say that modern-day Yakut blacksmiths worship Kudai Bakhsy? Yes, we worship Kudai Bakhsy and the Spirit of Fire, offer them gifts, “feed” fire, and ask them for help in what we do. Unfortunately, the knowledge and skills our ancestors possessed are partly lost. The ties between generations were broken in the Soviet Russia. Of course, blacksmiths were not persecuted at the time but their knowledge wasn’t passed on to younger generations with the public policy of atheism playing the crucial role in it. Iron production in the old-fashioned way, when it was extracted from the ore, is almost forgotten. Along with a few enthusiasts we have smelted iron this way several times. The problem, though, is that many details and secrets of this process have been forgotten. But we will continue working towards re-discovering the authentic Yakut blacksmith’s craft. Without the fundamentals, consisting of our ancestors’ traditions and ways, we won’t be able to move onto a new level. Posted on January 14, 2015, in Warrior Fieldcraft and tagged bysax, Knife, Siberian Indigenous peoples, wilderness knife, Yakut, Yakut knife. Bookmark the permalink. 5 Comments.